When you set up team-sourced metrics, your team members will be able to submit data moving forward, as well as the previous four values. So what happens if you have a large amount of historical data you want to upload for your newly creating metrics? Our Google Sheets add-on and our API are designed for this scenario. Here's a quick overview. To get started, you'll need to install the add-on, and have a spreadsheet you plan to import data from. 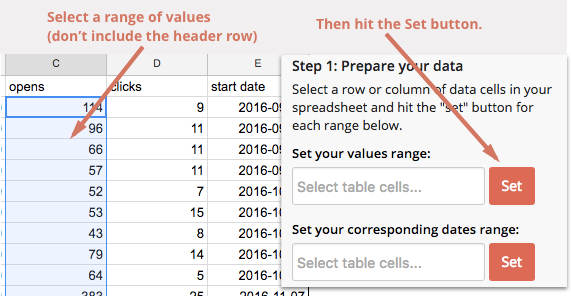 With Jama Analyze for Google Sheets, you will import one "ingredient" at a time by choosing a row or column of data and the corresponding dates. Using the API tokens found on your team's API page, you'll be able to match your data with existing ingredients or create new ones. Our Sheets add-on is built on top of our API, which means you can report historical data for existing ingredients. You can also write a script and update your ingredients on a set schedule, rather than having team members report on the data. We've had many customers use the API to report data this way from tools we don't currently connect with. If you'd like to learn more about our API, you can read about it here.